How can I make sure only artists can book the artist booths? Use your map settings! You can restrict particular booths or sections of your floor plan to specific categories. The portal will not let the vendor book outside of their category. To set these rules up, follow a simple two step process. First, choose a color for your section of booths. For example, make all the artist booths light blue. Second, go to your portal map settings, choose "Restrict booths to certain categories", and choose artists as the only vendors who can book light blue booths. Repeat with other color/category combinations. 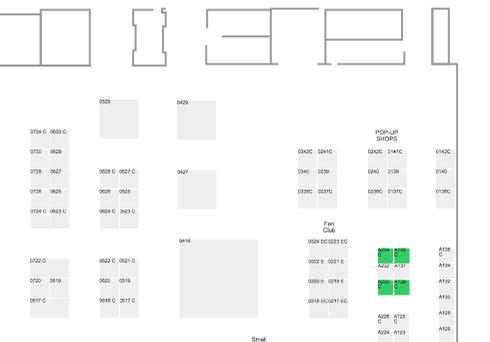 In the example below, the artist vendor sees only four remaining green (available) booths.